This fun cartoon design is a lovely light hearted way of sending your Season’s Greetings this festive season. 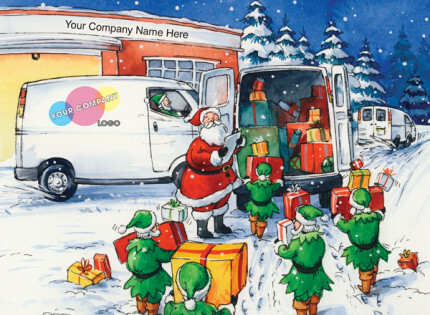 The main focus of the design is the colourful illustration of Santa and his elves filling the van up with neatly wrapped presents. The building and van in the background can be personalised with your company, corporate, business or personal name and logo to add that extra special finishing touch. Printed in the UK by Christmas Connections.